What is Deloitte Versant Test? 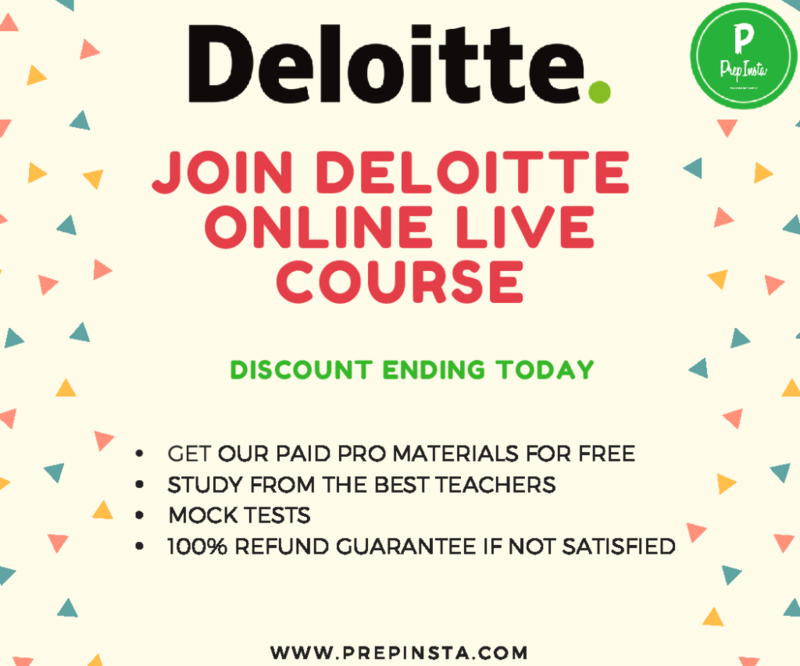 Once you complete your first round for Deloitte, the second round is the Versant Test also check the Deloitte Versant Test Cut Off. If Azpring Minds is conducting this test then, this test which is called SVAR will be there find the details for SVAR Deloitte test at the end of this page, if any third party is conducting this test then it will be called Versant test, Deloitte uses both SVAR and Versant also, the rounds in both exams are exactly the same, since it is standard test devised by famous laureate Rubin Versant, which is followed to test language fluency skills. You will get a sheet before you would be giving the test, the sheet will have the instruction for the test. There are five sections in the test starting from Section A to E each has individual Deloitte Versant Test Cut Off. The test is conducted on an IVR i.e. Interactive voice response you will need to call on a number. Generally this test is conducted in the Computer Lab of your College and you will be given a headphone and you will have to call a number from that system. But in some colleges where there is no proper infrastructure then Deloitte arranges direct Call via Mobile Devices. Hear a conversation between two people (Speaking in US Accent) for 3 mins once you complete this you will have to answer some questions based on this section. Fill in the Blanks will be there you will hear a sentence with blanks and you will need to fill those with correct words and ignore grammar errors. They will give you a random topic and about 10 seconds to think, then you will have to speak about it for a minute. One of the topic was importance of Physical Activities, this is also important for Deloitte Versant Test Cut Off. Have a phone with very good signal. Make sure no one will call you while attending. Try listening to the trial tests. Read and understand all the instructions. Note that Deloitte never declare or let you know a cut off for this test. Be as audible as you can. Keep yourself isolated from others or any other noise. Listen to the voice very carefully. Never ever ever get tensed. If you do you’ll loose your tone. Try to keep a normal slang by pronouncing each word properly. The cut off for Deloitte Versant Test will be 75%ile. If you are in the top 25% people then you will make it to the next round. This post will cover everything that you need to know for the test, this test is used by many call center companies and IT companies to check your speaking abilities. Since, in case of IT companies you will have to speak to on shore clients in US/UK/else where to understand their requirements and needs infact 30-40% of your day in IT company will be spent on speaking to the client via skype or email. Incase of Call center you need to speak to customers directly over call and 80% of your work will be on calls. So, to test your reading, speaking and writing abilities this test is conducted. 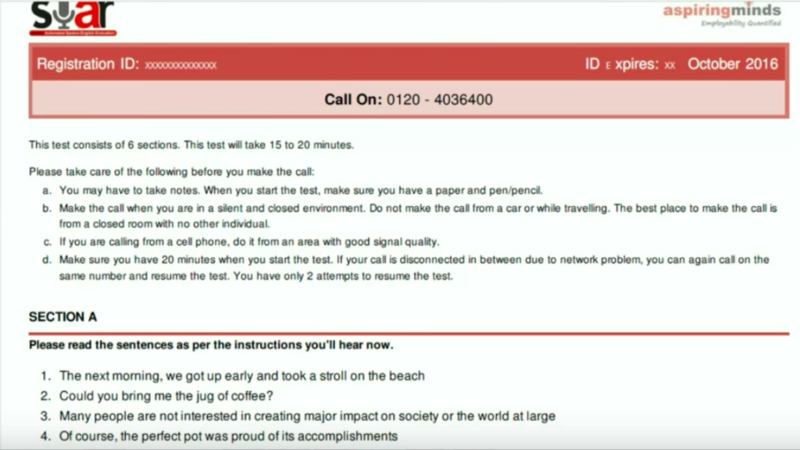 It is a telephone based test, which you can also attend by home or in case of on campus placements via portal connect a headphone and make a call to the number that they give you via computer. Step 1 – Make call to the number they provides to you. Note – Make sure that you have alteast 50Rs balance before calling the number(If you are taking the test at home). The number is not toll free and the call ending may result in test status as not completed. More than 50Rs balance in phone. Proper Network(Avoid making calls with JIO), though number of re-attempts allowed for the test are 2, in case of call failures. Speak where there is no background noise and disturbance in a closed room preferably. Note down Your ID, PARSE KEY (given to you by your test centre), SVAR ID, TEST ID in a notepad.You need to type these on your mobile’s keypad for verification. Avoid your breathing voice to be heard over call, make sure microphone is a little far from mouth. You need to hear those sentences properly and and recite them back to the IVR and then wait for next sentence to be recited by IVR and do this again 10 times. The length of the sentence will be long like – Jackson was a little perpetual after he gave the test and was psychologically not well since he feared in apathy of not doing well in the online test paper attended by him. Make sure that you hear the sentence from grammar nazi perspective. After 30 seconds are over you will hear a beep voice. Post which you have to speak again for next 45 seconds on the topic that was given by you. Never cut the call yourself after the test, wait for IVR to auto disconnect the call, because if you cut the call yourself, your test may show not complete error. SVAR Survey by Aspiring Minds: 97% engineers in India cannot speak English required for jobs in corporate sales/business consulting. National Spoken English Skills report, Engineers 2015-16 by Aspiring Minds, based on SVAR, India’s largest Spoken English Test. Around 3/4th engineers do not have spoken English skills required for any job in knowledge economy. Around 61% engineers possess grammar skills no better than a class VII student. Females score over males in written English while males show better Spoken element. Not more than 7.1% engineers can speak English with fluency that renders speech meaningful. Pronunciation and fluency are the major barriers in effective Spoken English. SVAR uses advanced speech recognition and machine learning algorithms to accurately gauge the quality of speech in various accents against a neutral accent. It contains sections where the candidate has to respond based on the dialogue s/he hears, repeat or read in English and also speak extempore (spontaneous speech). The tool provides a holistic score based on the CEFR standard, but also gives out individual scores on pronunciation, fluency, active listening, spoken English understanding, grammar and vocabulary. All these scores are based on a rubric and benchmarked against experts. Additionally, the SVAR report also provides job recommendations based on the scores: for what roles is the candidate hireable or trainable. This makes SVAR the most comprehensive tool to measure English listening, comprehending and speaking skills. SVAR’s advanced algorithms provide a score which mimic the expert scores with an agreement around 0. 95 (Pearson coefficient of correlation). It has been benchmarked with natives of multiple countries including India, Philippines, the Middle East and Americas. Our research team has capabilities to benchmark the tool fast for new geographies, new roles and requirements. SVAR has been used in the recruitment funnel for customer service and sales roles. It has helped companies improve recruitment efficiency by over 35% and reduce voice evaluation costs by 55%. SVAR when used on large scale can increase your sourcing reach exponentially. SVAR is often used together with Logical Ability and personality assessment in the call centre industry, providing performance improvements, on average, by 1.4-1.6 times. SVAR can be delivered using a computer or over a voice connection. Benchmarked extensively to work on mobile phone bit rates, the tool maintains its accuracy even while being delivered over a land line or a mobile connection. This helps use the tool remotely for evaluation. SVAR ensures integrity and capability to auto proctor by its advanced voice signature feature. At any time in the future, it can be verified if the candidate actually took the test on his or her own.